My husband just had a birthday. I wanted to make a cake that would knock his socks off. I saw this one on Kevin and Amanda's blog and thought it might do the trick. Start off with a boxed Devil's Food cake mix and a small box of chocolate instant pudding. Add sour cream, oil, eggs, milk, vanilla and chocolate chips. The batter is very thick. Prepare your pans by spraying with Pam. I also cut parchment paper circles, place them in the pan and re-Pam. This ensures my baked cakes won't stick. While cake is cooling, prepare butter cream frosting. 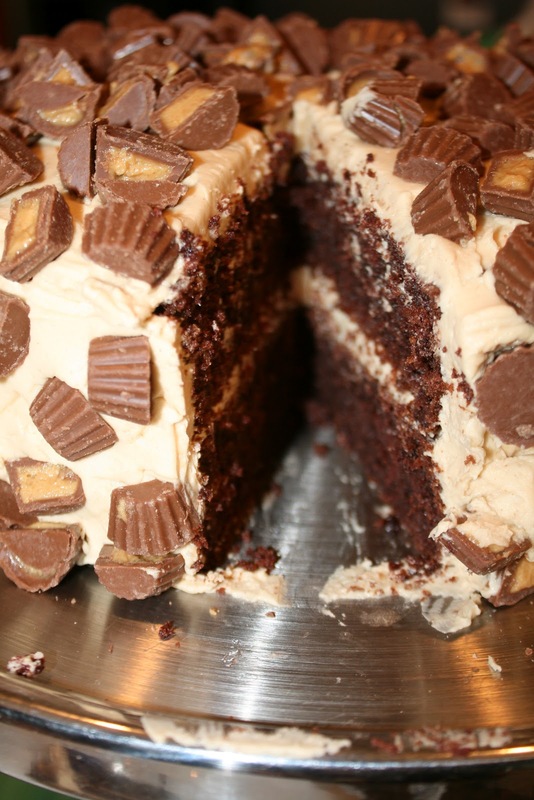 This recipe calls for 1/2 cup smooth peanut butter. When cake is cool, scoop frosting on the first layer (upside down on the plate so you have a flat edge to spread on). Add your second layer (right side up). Scoop the remaining frosting on the cake and smooth all around. Now take a bag (or two) of these babies and cut them in half. 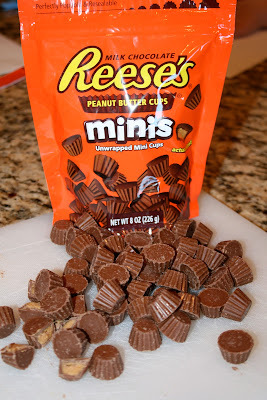 You can also use a bag of the individual cups; just cut them into bite-sized pieces. So they look a little like this. Start spreading them on your cake. Hmm...maybe a little more. That looks better. Waiting for the birthday boy. We'll use our "special" plate for his dinner tonight. Let's add lights and a birthday banner to let him know how much we love him. Preheat oven to 350 degrees. In a very large bowl, mix together everything except chocolate chips. Batter will be thick. Stir in the chocolate chips. Pour batter into cake pan of choice. (I used two 9-inch cake pans). For cooking time, I use the cooking times on the back of the cake box as a guide and usually add 1 minutes to whatever it says. Then I do the toothpick check, and if it's not done, I check on it every 5 minutes after that. It usually takes around 40 minutes for two 9 inch cake pans. In a mixing bowl, cream shortening until fluffy. Add sugar and continue creaming until well blended. Add salt, vanilla, and whipping cream. Blend on low speed until moistened, then add peanut butter. Beat at high speed until frosting is fluffy. 2 Response to "Peanut Butter Cake and a Birthday"
I want a birthday just to have this! You always know how to make people feel special..... you have a gift. I don't see how much sugar for the frosting. I was going to make today for my husbands birthday.